HHS Secretary Alex Azar, President Trump, and Vice President Pence in the White House Jan. 29, 2018. Image: White House photo/Joyce Boghosian. Rep. Hal Rogers (R-Ky.), chair of the House Appropriations Committee until the beginning of last year, had targeted AHRQ for elimination even after doctors warned him not to kill Guidelines.gov. As TYT reported on Sunday, Rogers doubled the number of health-industry companies in which he invested last year. The White House also pitched killing AHRQ. Under new Appropriations Chairman Rep. Rodney Frelinghuysen (R-N.J.), AHRQ was spared last year, but the Guidelines.gov budget was slashed from $2.1 million to $1.2 million. The national guidelines have been a target for Republicans since the 1990s, when back surgeons teed off on guidelines favoring nonsurgical alternatives for treating back pain. And big healthcare companies have billions of dollars at stake in which guidelines consumers use. An estimated 200,000 visitors turned to Guidelines.gov each month. For decades, the federal guidelines have had something of a monopoly. As of Tuesday, that will no longer be the case. And the healthcare industry has shown a willingness to shade medical guidelines to its benefit. In the early 2000s, one of Eli Lilly’s most high-profile drugs, Xigris, was supposed to make the company billions of dollars by treating sepsis, blood poisoning that kills thousands of Americans every year. Xigris was approved by the Food and Drug Administration even though the internal vote was evenly split. But the profits failed to materialize. In 2006, three doctors who worked at the National Institutes of Health wrote an article in the New England Journal of Medicine revealing details about what Eli Lilly did next. The company spent $1.8 million to fund a task force on Values, Ethics, and Rationing in Critical Care. The task force guidelines implied it was immoral for doctors to balk at the high price of Xigris—about $8,000 for the four-day treatment—and favored Xigris over older treatments which had not been subjected to clinical trials. Eli Lilly stood by its actions. It’s not clear which of the Xigris guidelines made it into the national clearinghouse. Online indices of the clearinghouse indicate show guidelines for Drotrecogin alfa, the generic name for Xigris, appear to have been part of the national clearinghouse. But even before Guidelines.gov went dark, those guidelines were reported as withdrawn. As of Sunday, the archive no longer appeared to be active. 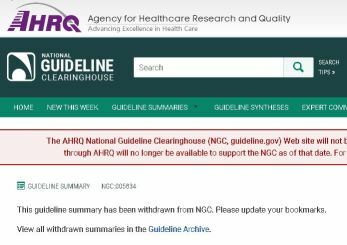 AHRQ has not publicly explained how it settled on Guidelines.gov for elimination—when AHRQ itself received a slight funding increase last year. AHRQ is an agency within the Department of Health and Human Services, which also includes the FDA. HHS Secretary Alex Azar was at the department during the Xigris incident, first as HHS general counsel and then as deputy secretary. From 2012 to 2017 he served as president of the U.S. division of Eli Lilly. Frelinghuysen’s federal filings show that at the end of last year he owned between $500,000 and $1,000,000 in Eli Lilly stock, with at least another $100,000 worth held by a trust fund. And follow TYT Investigates on Twitter, Facebook, and YouTube to stay on top of exclusive news stories from The Young Turks.